In the previous video, Part 1 of the Aromatic Nomenclature, you saw how to name Benzene molecules using IUPAC and common nomenclature for a substituted benzene. 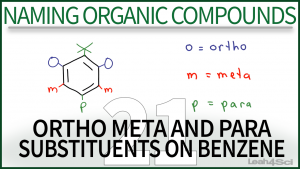 This tutorial video below, Part 2, will walk you through the IUPAC rules for naming disubstituted benzene compounds using ortho meta and para. This is Video 21 in the Naming Organic Compounds Video Series. Click HERE for the entire series.